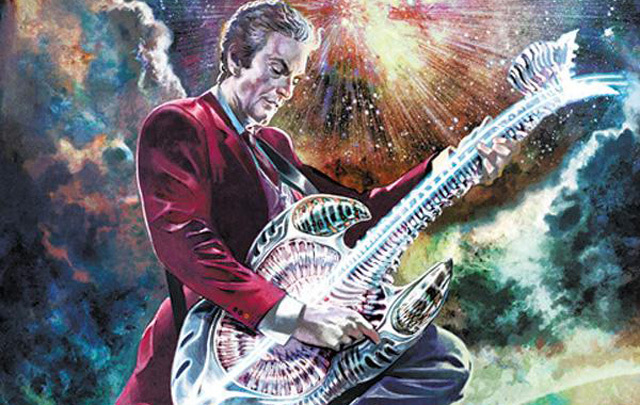 Titan Comics: Doctor Who - THE TWELFTH DOCTOR #2.6 Review | Warped Factor - Words in the Key of Geek. Tony twists again, like he did practically never. Sometimes, we read the Doctor Who comic-books without paying attention to who’s written or drawn them, hoping to be absorbed into the story and have our eyes treated to something exciting. You’re gonna want to buckle up for this one. The first four pages alone are enough to make you want to give thanks for the incredible good fortune of having human eyes. Seriously, four pages. Actually, one page is enough to make you feel that way, but it just goes on and on, one page after another, and those first four pages make you instantly curious, if you haven’t absorbed the information immediately, who the hell drew them, because frankly they’re in a league of their own, a combination of clarity of scenic vision and crispness of execution that astonishes, married to someone really good on colourwork. We’ll put you out of your misery early – it’s Mariano Laclaustra. If you read enough Doctor Who comic-books from Titan, everything slots into place as soon as you know that. Laclaustra’s been a name to watch for a while, adding a distinctive, adventurous style and that crispness to some of the best panels of joy-dripping artfests like The Swords of Kali and responsible for lead art on the 2015 Twelfth Doctor Holiday Special, which more than lived up to its name. Here he’s back in control of the visuals, and back in tandem with George Mann (himself famous for many a thing, but particularly for nailing the voice of any Doctor he’s given). They worked together to give us that Holiday Special, and to deliver one of the most genuinely creepy one-shots for the Twelfth Doctor, involving Charlotte Bronte and the kind of arachnophobic nightmare on which it’s really not a good idea to dwell if you don’t want to scratch your own skin off. In case we’re not making this clear enough, let’s make it simple. Buy everything that has Laclaustra’s name on it. Just do it, and do it now, and your eyeballs will thank you forever. Did we mention George Mann? George Mann’s having a good time of it lately with Titan – he knocked the first series of Eighth Doctor stories completely out of the park, and now he’s back with the Twelfth Doctor to deliver something that would be really rather special simply by virtue of where it comes in the timeline, irrespective of what it actually was. Yes, Clara-haters, do your little happy dance right about now – this is the first post-Clara Twelfth Doctor comic-book. 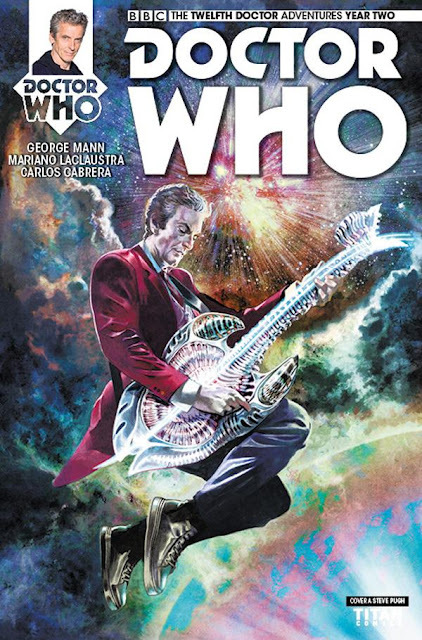 Mann throws us into the deep end of the mosh pit, with the Doctor getting his punk on at a gig on board The Twist, an enormous infinity symbol in space, in the 40th century. After the gig, he collars bassist Hattie (tall, lithe, pretty much Skin from Skunk Anansie…no-one? Philistines) and compliments her on her instrument. Annnnd then the running starts. Without spoilering the living bejesus out of you, there’s a guy on the run for a crime he probably didn’t commit, and the Doctor’s spotted him being chased by the forces of law, if not the forces of justice. The Time Lord makes contact with the man, Jakob, and uncovers notsomuch a murder as a visceral banquet, along with the potential reasons for it. Cue more running, leading to the reveal of one of the banqueters, which is entirely surreal – but that’s the thing about getting an artist like Laclaustra on the job. You can pitch surreal, you can write surreal. And then you give it to Laclaustra and what you end up with is something that looks every bit as weird as it was in your imagination – but with flesh, and muscle and as much reality as you or I. Not to overegg the Laclaustra pudding – no, really, we haven’t done that yet, we’ve given it just as many eggs as it needs and deserves – the artwork here is crisp throughout, Capaldi never looks like almost-Capaldi, but is always the man we recognise from the TV screen, and Laclaustra’s environments are always precise, full, and as complex as real life. There are sequences later in the issue that show the Doctor and his friends looking at multiple viewscreens, and the quality with which the screen action has been rendered is the kind of thing to make you drool into your anorak. Now here’s a thing. We mentioned someone really good on colourwork. We mentioned them because the light sources, the shading, and the luminescence of those screens, to name just three examples, is superb – again, it’s work that anchors the surreal sci-fi of Mann’s central concepts in the world and the universe we understand: the way the light behaves makes a beam through a window something we inherently recognise as true, the way a shadow falls across someone’s face inherently right, and it heightens our ability to lose ourselves in the story and the world that’s been created for us in The Twist. We thought there might be the hand of Luis Guerrero on colour here, but apparently not – step forward Carlos Cabrera (he of the colourwork on the Holiday Special) and Thiago Ribeiro, who clearly know their way around a light source, because it’s rare for us to compare anyone to Guerrero who isn’t Guerrero. How the Twelfth Doctor would survive and what he would be like in the post-Clara era was a source of concern to some fans. The BBC’s companion-reveal left many cold, though clearly more and better work will be put into introducing us to Bill properly within the show itself. With top-notch work from Mann, Laclaustra, Cabrera and Ribeiro though, the truth is that the post-Clara era has begun with more punch, more power and more believable pace in comic-books than it has on TV.